I make almost all of our meals, and I try to stay away as much as I can from sandwiches and frozen foods. This is no easy feat, especially for a working mom, but it is important to me to cook for my family. It is healthier and cheaper, and it also makes going out to eat that much more special for all of us. While it can be challenging to cook three meals a day almost every day, it can be done with preparation, the right tools and some creativity. 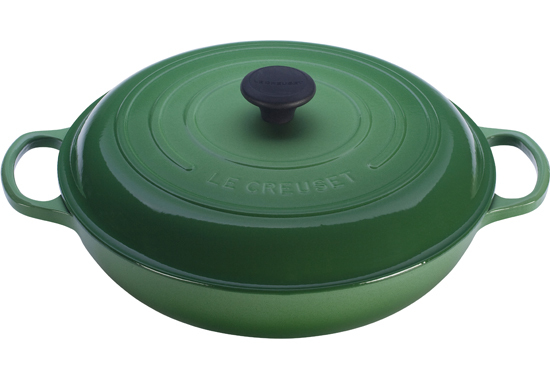 My braiser from Le Creusset is one of the most used wedding gifts. one-pot rice dish in less than 40 minutes. The Dutch oven always delivers perfectly cooked chicken and vegetables and the cast iron skillet I use almost daily to reheat food in the stove or the oven, sauté small quantities of vegetables, fry eggs, or grill sandwiches when we do have them. The Preparation: I am not a recipe cook. Unless I am cooking a special meal or baking, and sometimes not even then, I tend to look over recipes then make my own, so I rarely need specific ingredients. However, my spending at the grocery store, and the number of times I was visiting it, had become unsustainable so I started planning our weekly meals on Sundays. This is saving us money and time, plus I don’t have to constantly think about what is for breakfast, lunch and dinner, I just look at my meal plan and I make it. The Time: I find time to cook at all kinds of weird times during the day. For example, I like to have a hot breakfast several times a week, including a cream of cereal that I make from scratch in the evening. This only requires a couple of minutes of preparation, plus about 2 hours simmering –usually while I am watching TV or catching up on email– and an overnight stay on the stove. In the morning, all I have to do is reheat whatever we are going to eat, and save the leftovers for the next day. Last week, I roasted a chicken during the three rare morning hours I was working from home, then had it for dinner that evening. This weekend, I made banana bread while my son was finishing his breakfast. 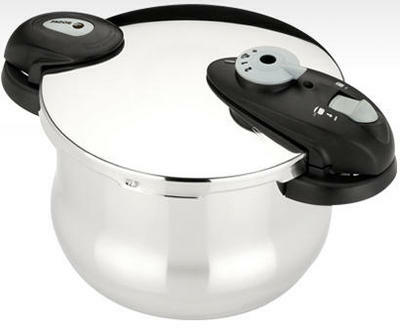 My Fagor pressure cooker makes cooking beans simple and easy. The Simplicity: A 3-course meal, or even a plate with three distinct choices is nice, but busy lives don’t always lend themselves to make this happen. Enter the one-pot meal; they can be very easy and fast to make, healthy and delicious. As a bonus, cleaning one pot beats cleaning 3 or 4 every time. In the fall and winter I make legumes on a weekly basis, sometimes more often. All it takes is 5 minutes the evening before, 10 more the next morning, then just 40-50 of unattended cooking time (you have to be in the house, but no stirring involved) in the pressure cooker. Here is a recipe for a black bean soup we all enjoyed last week. Root vegetables (onions, potatoes, sweet potatoes, carrots and garlic) in a Dutch over take very little prep time and are delicious and tender in 30-40 minutes in the oven. You can also add some chicken thighs to it, they’ll become fork tender and take on all the flavor of your vegetables as they cook together. I do like to make more special meals on days when we have extra time at home, and for special occasions, however, the day-to-day needs to be fast, easy and healthy. Delivering a Julia Child or Martha Stewart-worthy meal every time is just not feasible in my household, but to me home-cooked meals will always be better than take-out, drive-through or freezer aisle meals. Do you plan your weekly meals? If so, how? I’d love to get some tips!